The OnePlus 6T global launch is going to take place today, October 29, 2018. It will launch in India tomorrow, October 30 at 8:30 pm IST. The Chinese smartphone manufacturer is up for its next flagship mobile phone. The company re-scheduled the launch event to avoid the clash with the Apple’s October event which will take place on October 30. 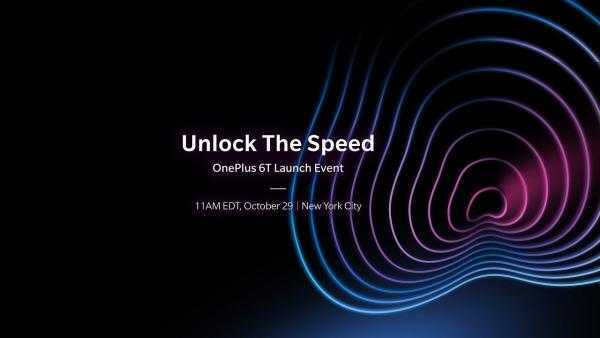 After a number of teasers and leaks associated with the next phone, the OnePlus 6T is finally, officially, going to debut today in an event to be held in New York at 11 am ET. 6T will become the first smartphone of the company to be launched in UAE. According to the expectations, it should bring numerous improvements compared to OnePlus 6. Some of the major updates include – an in-display fingerprint scanner, a bigger battery and the removal of 3.5mm headphone jack. Other leaks suggest that most specs and design elements will remain the same as of its predecessor. It includes – Qualcomm Snapdragon 845 SoC, 8GB of RAM, 256GB of internal storage, and a dual camera setup on the rear side. The company will live stream the New York launch event for the OnePlus 6T on YouTube today. As per the schedule, it will start at 11am EDT and the viewers will be able to catch the action in real-time. All details including price, specifications, features, etc. will be revealed today in the event. So, you need to watch online to know them. A few days ago, the OnePlus 6T was spotted listed on a European site which leaked its price. Though the listing was removed very quickly, it said that 8GB RAM/128 GB storage variant will be priced at EUR 569 in Europe. A number of leaks have been making rounds for a long time now, but nothing is clear as of now. 3T was launched at a premium of Rs. 2000 more than OnePlus 3. Then, 5T was launched at the same price tag of OnePlus 5. However, we suspect that 6T is going to cost a bit more bucks than OnePlus 6 due to the inclusion of the in-display fingerprint sensor and a larger battery. The pre-bookings have already been started on Amazon as usual. The customers need to pay a nominal fee of Rs. 1000 to pre-book the smartphone. The pre-booking will include freebies when the sale starts from November 1, 2018, onwards. The interested buyers will get to attend pop-up events of OnePlus in 9 Indian cities and in 12 different locations on November 2. Some of the OnePlus 6T specs have already been confirmed like an optical in-display fingerprint sensor, a larger 3700 mAh battery, no 3.5mm headphone jack, Snapdragon 845, and a few other things. The leaks have suggested that there will be improvements over its previous variant. OnePlus 6T will run on Android 9.0 Pie, sport a 6.4 inch FHD+ Optic AMOLED display with 19.5:9 aspect ratio, powered by the octa-core processor, paired with Adreno 630 GPU, with up to 8GB RAM and 256GB of inbuilt storage, etc. The dual camera setup includes a 16MP primary sensor and 20MP secondary sensor. On the front, there will be a 20-MP selfie camera.